I love this!! Love the many shades of brown and the many textures in her outfit. She definitely pulls it off. Dear Sartorialist, thank you for showing two women today head to toe (not just face) with great style. Great job!! Any idea what the fabric of the coat is? How the pattern was achieved? I forgot what fur the coat is but it’s a Fendi, about 5-6 years ago if i’m not mistaken. 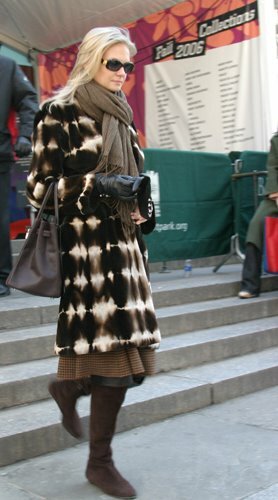 Actually, the coat and the boots are both Oscar De La Renta, this season, and the bag is obviously a chocolate birkin. Classic mix of tweed, fur and flat suede boots!Oh, and blonde hair!!! and just for the records, I´m not jealous, I´m not!